Previously unreleased album by the master guitarist. A lost gem from the Westbound vaults. Guitarist Melvin Sparks was one of the Heroes of Acid Jazz on a mid-90s tour sponsored by BGP. His fluid bluesy style lit up a series of records on Prestige, Eastbound and Westbound as leader and on dozens of sessions backing artists such as Leon Spencer, Charles Earland and Lou Donaldson. His oeuvre was funky organ-based jazz, closer to the R&B charts than John Coltrane, but he kept his solos interesting and always had something to say. Born in Houston, Texas, he started his career in music in R&B road band the Upsetters – long after their time backing Little Richard – before stopping off in New York in the mid-60s and joining Brother Jack McDuff’s group, which led to his first recordings. Once he had proved reliable in the studio there was no stopping him – first at Blue Note where he played behind Lonnie Smith, then as first call for Lou Donaldson and at Prestige behind Donaldson alumnus Charles Earland. His talent was recognised by Prestige A&R man Bob Porter, who provided him with session work and gave him his break as a leader with the excellent 'Sparks! ', which he followed with equally strong 'Spark Plug'. Porter had left by the time of the third album, 'Akilah! ', but the two men reunited at Detroit’s Westbound label, where they made the highly collectable 'Texas Twister'. However, the market for jazz was changing, and by the time of his next album, '’75', more soul elements were added, including vocals by Jimmy Scott on a couple of tracks and some by Sparks himself. A follow-up, 'I’m Funky Now', was planned but never released, although a sequenced production master was made. Issued here after a 41-year wait, the record is packed with big funky band arrangements, although Sparks is featured less prominently than on his earlier albums, which might account for its original cancellation. That said, it is a fantastic piece of work, and we are proud to be issuing it for the very first time. Born in Houston on 22.03.1946 and died on 15.03.2011 in New York. 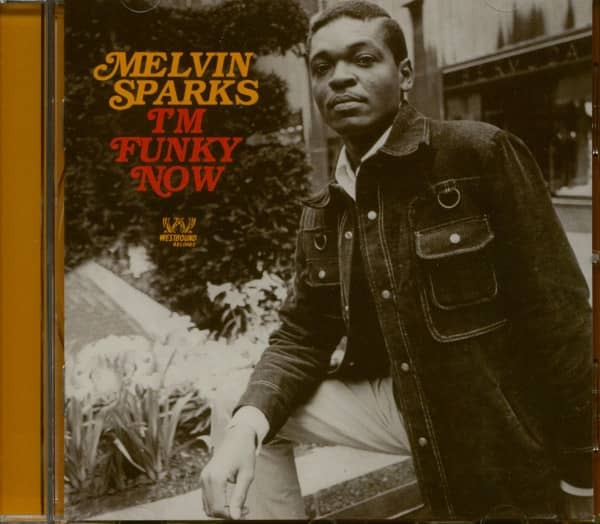 Melvin Sparks accompanied B.B. King at concerts. In 1963 he became a member of the band "The Upsetters", who for Example Little Richard or Sam Cooke accompanied on stage. In addition, Melvin Sparks recorded some albums for Prestige Records. Customer evaluation for "I'm Funky Now (CD)"